On Sunday, May 20, several members of the Northern California chapter of the Association of Professional Genealogists met at the Colma Historical Association for a tour of several of the cemeteries. The tour leader was Pat Hatfield of the historical association. She and two more volunteers from the association took us on a whirlwind cross-city jaunt that lasted more than three hours. Colma is a city of 2.2 square miles that has 17 cemeteries. It became a "land of the dead" when San Francisco decided that its limited land would be more valuable as commercial development than as home to the deceased. City ordinances declared that having cemeteries in the city limits was dangerous to the public health. Holy Cross Cemetery opened in 1887, followed by Hills of Eternity, Home of Peace, and Eternal Home. Other groups bought land in Colma, which was easily reachable by train, streetcar, and even automobiles, and an industry was born. The only cemeteries officially left in San Francisco are at the Presidio (military graves), Mission Dolores (early natives), and the Columbarium (cremations). We visited Greenlawn, Cypress Lawn, Holy Cross, Hills of Eternity, Home of Peace, Eternal Home, Olivet, the Italian Cemetery, and Woodlawn. Along with being shown many celebrity graves (William Randolph Hearst, Governor Pat Brown, Joe DiMaggio, Wyatt Earp, Emperor Norton, and more), we also heard a lot of the history of Colma and of the individual cemeteries (including the fact that two of the cemeteries have recently been bought by a nationwide conglomerate, which didn't seem to sit well with our hostess). Some of the most interesting graves on the tour were at the large plot at Olivet reserved by the "Showfolks of America." This was a group of performers who bought the section in 1945 and contracted with Olivet that all burials would be at the price set at the time of purchase, which is still being enforced today. One performer buried in the section is Alfred "Dusty" Rhodes, an early movie stuntman, who fell to his death from the Golden Gate Bridge in 1948 while trying to prove he could survive a jump. If you are interested in learning about Colma's cemeteries and who is buried there, I highly recommend the tours given by the Colma Historical Association. The volunteers are knowledgeable and accommodating. The tours do not have a listed price, but donations are gratefully accepted. 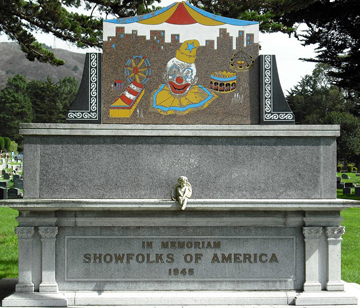 That memorial stone for the Showfolks of America is just a bit... I don't know...creepy isn't the right word. Unique. That's one way to describe it. If you hadn't shared the story behind it, it would have been a very odd image to start my day with. Thanks for sharing what you learn with us! I agree it's a unique memorial. I hadn't thought of it as creepy in any way, though. I rather liked it. I didn't think of it as much different than the type of memorial stone you see for a plot for oh, say, a fraternal order. To each his own, as always! So where did you say East Friesland was? New Issue of "The Galitzianer"